Your greatest obstacle as a parent isn’t the television or the Internet in helping your children love and use the Bible. It will be your unwavering tenacity that makes the biggest difference. In the age of the Internet, travel sports teams, and the television—parents have to make more effort to intertwine the scriptures into their family’s everyday life. The following tips will get you on the right track. “Ascribe to the Lord, all you families of nations, ascribe to the Lord glory and strength” (Psalm 96:7). All the best intentions in the world won’t persuade your children to love and use the Bible. There are many good excuses that will grow into major hindrances that will keep you from having a consistent flow of scripture in your home. Before you begin this life journey, pray and ask the Lord for wisdom, strength, and discernment to make it happen. 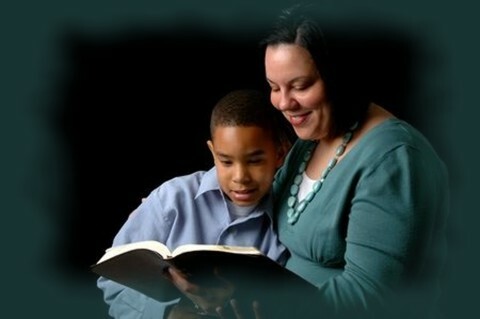 Children who’ve learned to love and practice scriptural truths have parents who’ve modeled it first. Donald Miller wrote it best, “What I say I believe is not what I believe; what I believe is what I do.” Take time to reflect over your life, over the last year, and over the last few days—where did the Scriptures come alive in your speech, attitude or conduct especially in the home? Put in the intentional effort of living what you believe about God’s word. When children are growing up especially in their baby to toddler years, parents have the incredible opportunity to make the scriptures come alive. Reading through the colorful illustrative Bible texts will give them visuals about God and His truths that will remain imprinted in their hearts for the rest of their lives. As they grow older, keep rehearsing the same scriptural truths during meal times, vacations, family church gatherings, and reunions. “And there rejoice before the Lord your God—you, your sons and daughters” (Deuteronomy 12:12). There are many ways to engage your children with Biblical precepts: make up a crossword puzzle or word search with the memory verse of the week or write a Bible verse on a dry erase board and every day erase one word until the whole verse is gone—afterwards have one of your children write the scripture in its entirety. Offer unique rewards for those who accomplish this task—make sure mom/dad are also challenged in the same manner—perhaps with more verses to memorize. The words of Scripture can be a balm of comfort and refreshment during the difficult days ahead. Raising your children in a Christian home makes them more of a target for tauntings from the flesh, the world, and the devil. They’ll be challenged in what they believe at school, in the neighborhood, and even at church. Always direct their attention to the revelations of the Bible. Be wise and discerning so that the Bible doesn’t become a rod to beat over their heads. Rather the words of Scripture can be a balm of comfort and refreshment during the difficult days ahead. “Write them on the door frames of your houses and on your gates” (Deuteronomy 6:9). December is a good month to seek out the Lord’s direction for the coming year. In prayer and fasting, find a scripture that really speaks to your heart for your family. On the first day of the year, post this scripture where everyone can see it and make it your family’s theme scripture for the year. After January, challenge (in a fun way) your family to have a monthly or weekly scripture that flows out of your yearly theme. “If anyone speaks, they should do so as one who speaks the very words of God” (1 Peter 4:11). This isn’t the Sunday School pattern of standing up and reciting in front of’ a group—although it’s good to do this every now and then. Rather this recitation happens around the dinner table or in the car as you discuss the happenings around the world, in their schools and/or neighborhoods, or church. Ask them what the Bible teaches about how to handle difficult situations and let your children repeat back to you the words of God they’ve learned. “Assemble the people before me to hear my words so that they may learn to revere me …and may teach them to their children” (Deuteronomy 4:10). It’s possible for children at any age to love and use the Bible; however, there are challenges for every individual family. The greatest tip of all is that you as the parent keep your close connection with God seeking His wisdom on how to go about this journey. It’s not the number of scriptures they know or how well they can recite it. It’s that one verse that God sews into their souls that even when they’ve grown up—it will never stop reverberating in their hearts. Be God’s ambassador to make sure this happens as much as it’s up to you and let the Holy Spirit do the rest. Excellent article…posted on fb for the young parents and grandparents I know. Thank you for using your gifts to promote God’s truth.